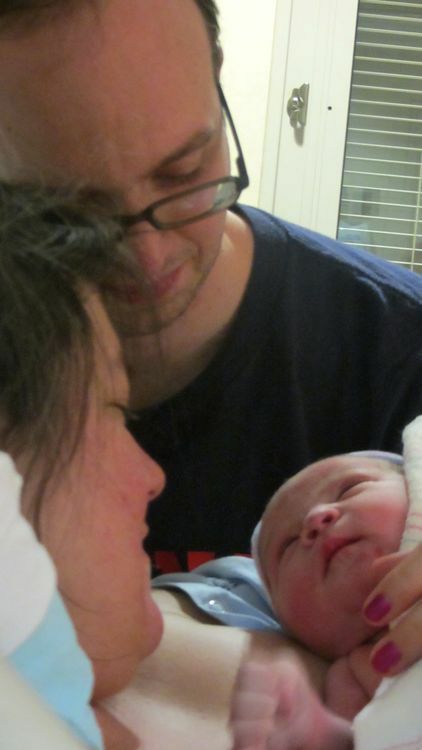 On Saturday, June 8th, at 11:04 am, in the warmest room at Beth Israel Hospital, we welcomed our daughter, Winifred Eleanor Guinn Anderson, with her wide eyes and mess of silken hair, into our arms. She weighed 8 pounds, 10.5 oz, measured 21 inches long, and had the softest skin and most wonderful smell I’ve ever smelled. She snuggled on Mama instantly, and was nursing within a half an hour. If I were to write about every moment of the week of prodromal labor leading up to the birth, my birth story would give Homer a run for his money. Instead, suffice it to say that I contracted for hours on hours- but the contractions would be regular but not painful, or painful but not regular, or regular and painful but not frequent enough, and at some point they would fade or something else would signal that these were not, in fact, THOSE contractions, and I would cry or sleep or throw myself into some nesting project and hope that it would all begin, in earnest, soon. Nope, still not twins, but thanks for your input, lady at Target. Based largely on this review of randomized controlled trials, as well as conversations with our providers throughout the pregnancy and the fact that my cervical changes and other signs deemed me a good candidate for successful induction, we decided to begin induction at 41 weeks. The evidence demonstrated, to us and to our providers, that expectant management past 41 weeks carried a small (really, very, very small) risk and didn’t appear to improve our ability to avoid a C-section. I feared induction more than almost anything else during the pregnancy, but felt confident in the literature and my doctors. Further, my doctors didn’t pressure me in the slightest to induce— we calmly discussed my situation in light of the evidence, as well as their experiences, and they reiterated many times that I had the option to choose whatever date I liked to schedule induction (as the scheduling needed to be done for logistical reasons) so long as my 40 week biophysical profile was reassuring. It was, and above all else, I felt in my gut that this was the right thing to do. 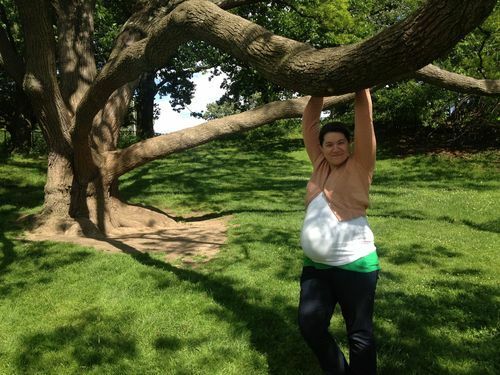 The first of many, many walks, during which it appears I’m trying to jiggle the baby out. In the days leading up to labor, I tried every gentle, natural method to get things moving that we could: I ate multiple whole pineapples daily, gobbled licorice by the handful, went for five-hour walks, and engaged in a few other activities I’d rather not mention in a space that my grandmother may read. We didn’t go for castor oil, evening primrose oil, or blue cohosh or any of the other more intense herbal induction methods because in my mind, those were induction methods just the same as the one I feared— and they were in some cases correlated more highly with pregnancy complications that would undermine my desire for a vaginal delivery. I know that those methods have helped many, many women, but I knew that they just weren’t for me this time around. 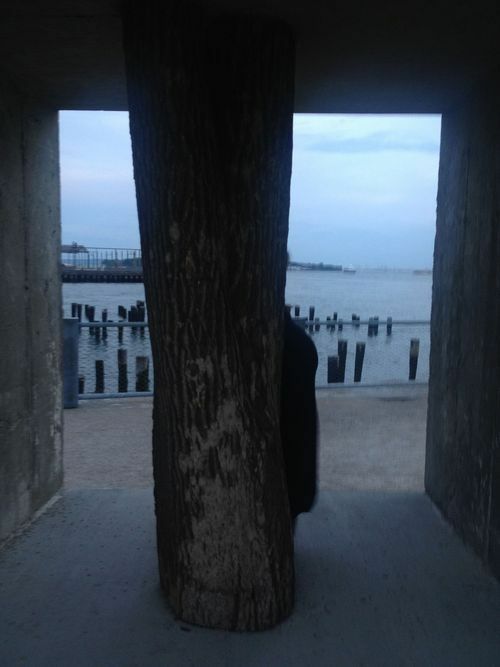 In which I unsuccessfully attempt to hide, on our last walk at Brooklyn Bridge Park. I took time each day to quietly observe Winifred’s movements to determine her position. She remained occiput posterior throughout the week before she was born, and I was convinced that her position was preventing further descent, as an OP presentation makes it more difficult for the head to fit neatly within the pelvis. When I wasn’t walking or chopping up another pineapple, I was glued to Spinning Babies, trying all manner of inversions and hip circles, along with Walcher’s and abdominal lifts when I was contracting. 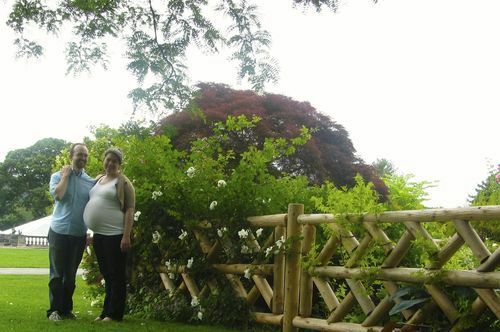 I knew that most OP babies turn in labor, and I also knew of plenty of mamas who delivered their babies OP with no problems at all, but I wanted to do everything I could to help make Winnie’s trip to meet the world easier and, well, sooner. This what an inversion looks, in case you were wondering. It’s super flattering. Try as we might, this little one was snug and cozy in mama’s growing belly and it turned out she needed more than a little coaxing to come and join us. In the wee hours of the morning of Friday, June 7th, I lept out of bed to meet Mike— and bacon, eggs, and coffee— in the kitchen, where we puttered around making sure all was in order while trying not to wake my mom. We watched the sun rise from our kitchen window, double (triple and quadruple) checked our list one last time, and slipped out the door to head to the hospital. 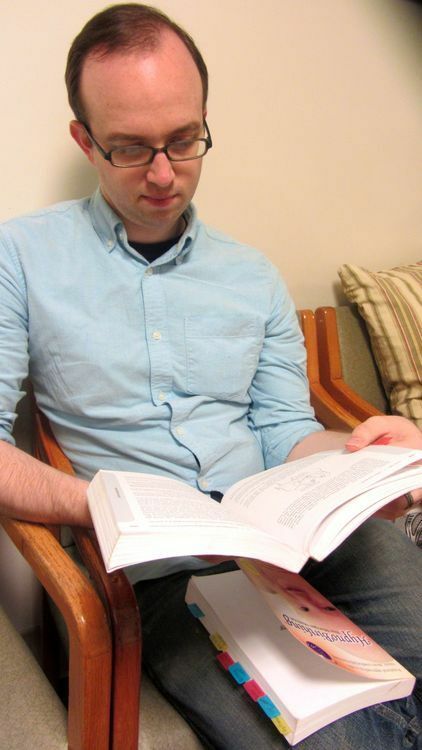 Mike diligently reviewing the dogeared pages of Penny Simkin’s The Birth Partner. 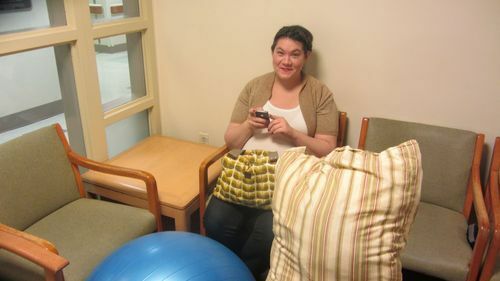 My little nest in the corner of the waiting room. We arrived two hours before our scheduled induction, and spent a few hours in the waiting room watching terrible morning shows abuzz with news of the Cronut while I scarfed granola bars like each would be my last (24 hours of hard work on an empty stomach is no joke!). Finally, a nurse lead us back to a labor room with a view of the Chrysler Building and the torrential rains of Tropical Storm Andrea. Soon enough, my IV was in and, after a chat with the attending physician, the Pitocin drip began. 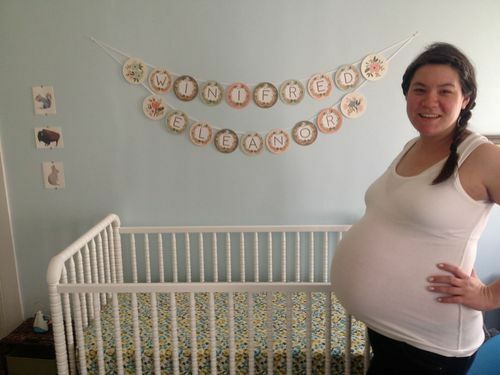 We texted our wonderful doula Jillian, and she made her way in from Brooklyn to meet us. One way or another, after months of waiting, we were going to meet our sweet bean. Our last photo as a family of two. Where did she get so much cute?